We propose an expressive but decidable logic for reasoning about quantum systems. The logic is endowed with tensor operators to capture properties of composite systems, and with probabilistic predication formulas P ≥ r (s), saying that a quantum system in state s will yield the answer ‘yes’ (i.e. it will collapse to a state satisfying property P) with a probability at least r whenever a binary measurement of property P is performed. Besides first-order quantifiers ranging over quantum states, we have two second-order quantifiers, one ranging over quantum-testable properties, the other over quantum “actions”. We use this formalism to express the correctness of some quantum programs. 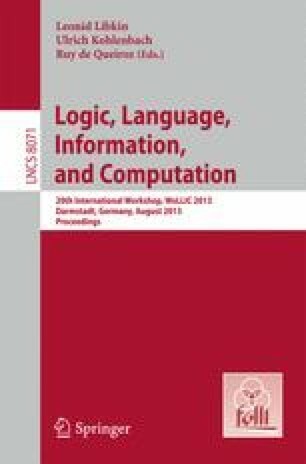 We prove decidability, via translation into the first-order logic of real numbers. The research of J. Bergfeld, K. Kishida and J. Sack has been funded by VIDI grant 639.072.904 of the NWO. The research of S. Smets is funded by the VIDI grant 639.072.904 of the NWO and by the FP7/2007-2013/ERC Grant agreement no. 283963. The research of S. Zhong has been funded by China Scholarship Council.